Skylar Seward was 15 in 2013 when the car she was riding in swerved left and went off the roadway on Interstate 5 near DuPont, Pierce County, colliding with an unprotected concrete pillar in the freeway median. The state of Washington has agreed to pay $28 million to a woman who was paralyzed when the car she was riding in crashed into an overpass support pillar on Interstate 5 five years ago, the woman’s lawyers said Monday. Skylar Seward was 15 in 2013 when the car she was a passenger in swerved left and went off the roadway on Interstate 5 near DuPont, Pierce County. The concrete pillars in the median weren’t protected by a concrete barrier, a metal guard rail or a wire fence. Instead, the only thing between the travel lanes and the pillars was an “earth berm,” a mound of dirt that instead of deflecting the car away from the massive pillar, served as a sort of ramp, directing the car into the structure, according to court documents. Seward was paralyzed from the chest down. She sued the state in 2016, alleging that the roadway was unsafe and the state was negligent for not replacing the berm with a concrete Jersey barrier or guardrail. Not only did the Washington State Department of Transportation (WSDOT) know the berm was unsafe, Seward’s lawyers said, but the agency had a plan and funding to replace all 198 such mounds throughout the state. The work was never done in DuPont. “I’ve handled highway design cases against the state for 40 years and never have I seen a case where the state was this negligent,” said Keith Kessler, Seward’s lead attorney. WSDOT confirmed the settlement, but declined to comment further. The Washington Attorney General’s Office, which negotiated the settlement, also declined to comment, referring questions back to WSDOT. The case was scheduled to go to trial on Monday. Instead, the state agreed Friday afternoon to pay Seward $28 million “to care for her needs for the rest of her life,” her lawyers said. The handwritten, one-paragraph settlement also includes a $50,000 payment from the woman who was driving the car. 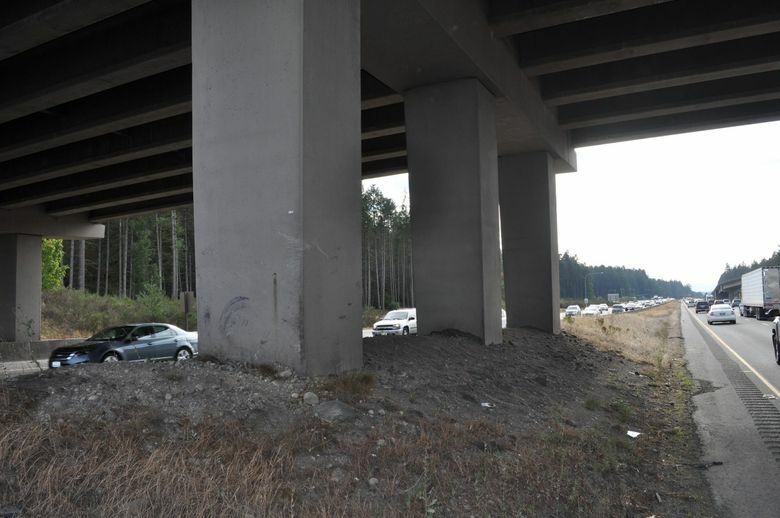 The state of Washington has known for decades that earth berms are not a suitable barrier between the roadway and fixed objects, such as the concrete pillars, according to the lawsuit. When the state built the Center Drive overpass to I-5 in DuPont in 1997, it put an earth berm in the median, leading directly to the overpass pillars. The state sponsored crash testing in Texas in 2001, to determine how well earth berms of various slopes protect vehicles that go off the road. The answer, according to the lawsuit, was not well: “The earth berm failed to deflect or redirect the test vehicle,” the lawsuit says. After a 2003 fatal crash on Highway 522 involving an earth berm, WSDOT revised its design manual to end the use of earth berms as barriers. “The use of redirectional land forms has been discontinued as a means for mitigating fixed objects,” the new design manual said, according to the lawsuit. Hazardous objects, like the concrete pillars, should instead be moved, made safer or “shielded with barrier,” the manual said. In 2006, WSDOT started a six-year plan to replace all the earth berms it had built over the past decades. The pillar that Seward crashed into was shielded with a barrier, but only on the northbound side of the Interstate. That barrier was even replaced in 2012, according to the lawsuit, but the state neglected to put in a similar barrier on the southbound side, where Seward was traveling. WSDOT said it has identified 201 earth berms that needed to be fixed. Of those, 160 were fixed by the time Seward crashed in 2013, and 15 have been fixed since then. Twenty-six earth berms remain unfixed on state roads and highways, due to be replaced by 2021, WSDOT said. Each one costs between $80,000 and $120,000 to replace, WSDOT said. David Gutman: 206-464-2926 or dgutman@seattletimes.com; on Twitter: @davidlgutman.